You’re staring down at your shiny, unwrapped, brand new smartphone—so what do you do next? Where do you start with the hundreds of thousands of apps at your fingertips? 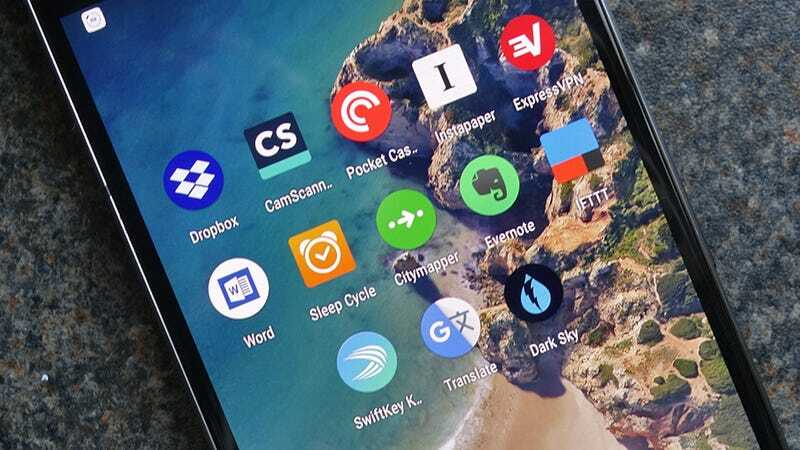 These are the apps we always install first on any new iOS or Android device. We’ve focused on utility apps and tried to steer clear of social media, messaging apps, and media apps like Netflix and Spotify. You’ve probably already got your firm favorites as far as those types of apps are concerned. These are more practically useful apps that aren’t quite as well known. The rise of iCloud, OneDrive, et al might have taken some of the shine off Dropbox, which was the first app to properly handle syncing and cloud backup, but it’s still the best option for sharing files and moving them around between platforms, and of course for backing up your photos. You’ll probably want to fork out for 1TB of storage though, for $9.99/month. We’ve got nothing against Apple Photos per se, but Google Photos works perfectly across Windows, macOS, Android, and iOS, and won’t cost you anything at all if you don’t mind a bit of resizing. Those considerations, plus all of Google’s smart image recognition and a few neat editing tools, mean it’s our default choice for managing photos and videos. Weather apps are everywhere and you probably already have one preinstalled on your phone; if not, you can just Google “what’s the weather?”. What makes Dark Sky worth a look, though, is its hyperlocal, predictive forecasts that can give you a very useful heads up if rain is coming (or stopping). It takes a lot of the guesswork out of predicting the weather. Evernote’s star has waxed and waned somewhat across its nine year history, but we continue to love it for its cross-platform syncing, its flexibility, and the host of features that it offers, some of which you might have forgotten about—like handwriting recognition, presentation mode for the big screen, and easy note clipping from just about anywhere. There’s very little to choose between this and Pocket but we’ve opted for Instapaper as the cleaner and more focused of the two. Anything on the web you don’t have time to read immediately, send over to Instapaper, and it’ll be there waiting for you in an ad-free, clean, clear, format that doesn’t make you want to throw your phone out of the nearest window. Alright granddad—installing Word might feel like a step back in time but Microsoft’s mobile apps are more nimble than you might think, and having Word on board ensures you can view all those email attachments properly. Plus, if you do want to jot down some ideas or the start of the great American novel on the go, then Word is one of your better options. You’re going to be doing a lot of typing on your mobile device, and SwiftKey takes that text (and emoji) input to the next level with features such as AI-powered autocorrect, the option of swipe-to-type, and a pile of customizations that help you make your keyboard your own. There’s also integrated support for typing in more than 150 different languages. CamScanner isn’t unique in being able to turn your paper documents into digital versions with a snap of your smartphone’s camera, but it is the best app we’ve found for the job: The smart crop and auto-enhance features just work, with the minimum of fuss, and if you stump up $5 a month you can get OCR text recognition plus a bunch of other extra goodies. An app that really shouldn’t need any introduction, Google Translate is already very, very good at getting text, audio, and images translated from one language to another, and it’s only going to get smarter over time with Google’s AI improvements. Clean and easy to use, and with the option of caching some language packs for offline use while roaming as well. Sleep Cycle isn’t unique in what it does, but in terms of support for both Android and iOS, and the straightforward way it operates, it’s hard to beat. You’re probably familiar with the idea, but if you’ve never tried it, give Sleep Cycle a go: It analyzes your sleep quality while you doze to wake you up at the most optimum time, based on your patterns of slumber. You’re probably familiar with the benefits of using a VPN (Virtual Private Network), especially when connected to public wi-fi, and ExpressVPN is one of the leading choices for mobile from a very, very big field. Its intuitive interface, its money-back guarantee, the choice of VPN locations and the prompt support are some of the reasons it stands out. Why do you need a public transit app when I’ve got Apple Maps and Google Maps, you might think. Well, so did we, until we actually installed and used Citymapper: It makes hopping from bus to train to tram across a metropolis so straightforward that it feels like magic, and it’s overflowing with good ideas, like an alert when your stop is coming up. Picking a podcast app is kind of a subjective choice, like whether you prefer Apple or Google’s music service, but we keep coming back to Pocket Casts. The interface is smart, the app is packed with useful features like intro skipping and easy episode clean-up, and there’s a recently revamped web interface too, that automatically syncs with your phone.